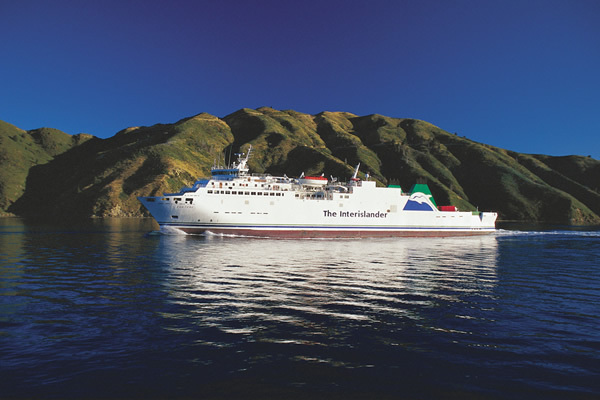 The Interislander's three ferries - Kaiarahi, Aratere and Kaitaki, offer a convenient and regular daily rail, commercial freight and, passenger ferry service crossing Cook Strait from Wellington in the North Island to Picton in the South Island. The 92 km, three hour journey between Wellington and Picton is one of New Zealand's most iconic tourist experiences, and one of the most spectacular cruises in the world. Your Interislander ferry journey starts from Wellington, with it's picturesque harbour, crossing Cook Strait - a 30 kilometre stretch of water separating the North and South Islands before entering the sheltered waters of the magnificent Marlborough Sounds finishing at Picton, located in a sheltered marine harbour, where you will have time to experience this charming small town before connecting with your bus or train service to other South Island destinations. Interislander ferries offer a range of on board facilities for you to enjoy as you view of some of New Zealand's most unique scenery. Enjoy a movie, a drink in the bar and anything from a snack to a three course meal. A nursery, comfortable passenger areas and lounges with reclining seats and foot/head rests, plenty of open deck space, children's play area and an Information Centre. Each ferry has a Premium Plus lounge that offer the most comfortable and luxurious way to travel across Cook Strait. Premium Plus lounges offer a quiet comfortable areas of the ship offering comfort seating, complimentary food and beverages, magazines, newspapers and Sky TV. Whether you're in New Zealand at the moment or planning your trip to New Zealand from elsewhere in the world, you can reserve your space on an Interislander ferry now. 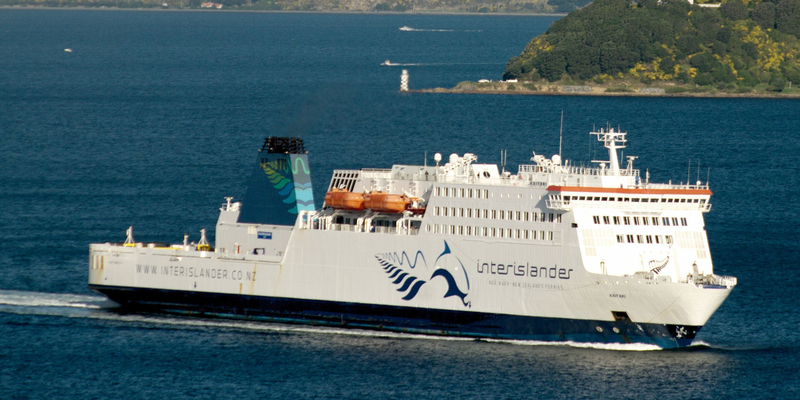 Bookings on an Interislander ferry are essential, and are usually available up to six months in advance. Foot passenger space is limited - especially if you are travelling during school and public holidays, so its recommended that you try to book early. Crossing time is 3.5 hours for the Arahura, Kaiarahi and the Kaitaki. 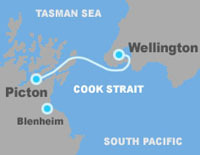 There is transfers between Interislander's Wellington Ferry Terminal and Wellington Railway Station. All bus and coach services to and from Picton depart and arrive at Interislander's Picton Ferry Terminal and to and from Wellington depart and arrive at Wellington Railway Station. Major rental car operators like Avis, Hertz, Budget, Europcar or Thrifty will not allow their rental cars to travel between the North and South Islands on any Cook Strait ferry service. You will have to drop off at Wellington and pick up a new car at Picton if travelling north to south or drop off at Picton and pick up in Wellington if travelling south to north.